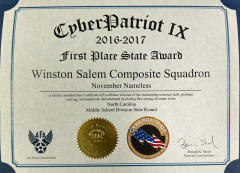 3/17/2017–WINSTON-SALEM, NC–A team of middle school students from the Winston Salem Composite Squadron (NC-082) recently concluded an exceptional round of competition in the ninth season of CyberPatriot – the National Youth Cyber Defense Competition. 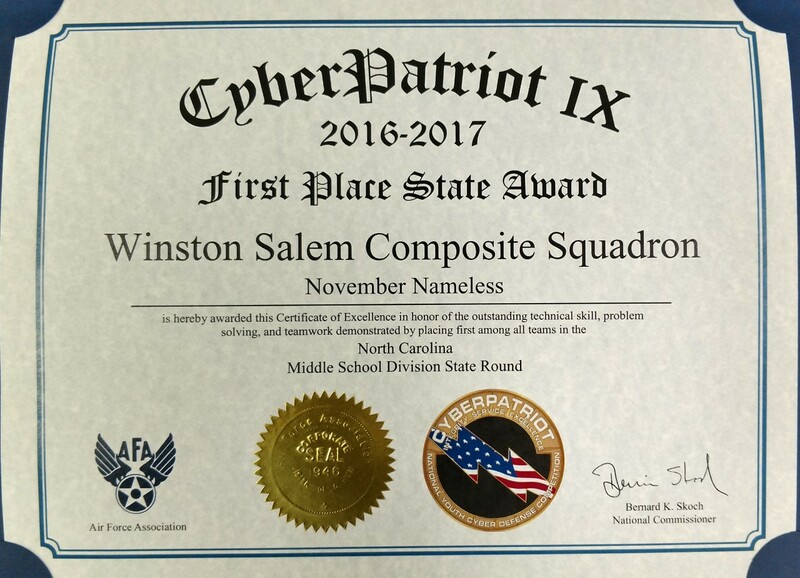 Led by their Coach 1st Lt Omar Khouri, CAP, the team of cadets from NC-082 excelled in the CyberPatriot IX qualifying rounds, demonstrating teamwork, critical thinking skills, and technical knowledge key to a successful career in cybersecurity. The team’s performance earned it a spot in the State Round held 3-5 Feb. 2017. During the State Round, the team outscored other NC teams to win the Middle School 1st Place State Award! Established by the Air Force Association, the CyberPatriot National Youth Cyber Education Program was created to excite, educate, and motivate students toward careers in cyber security and other science, technology, engineering and mathematics (STEM) disciplines critical to our nation’s future. CyberPatriot’s core program – the National Youth Cyber Defense Competition – challenges teams of two to six students across the United States, Canada, and other schools abroad, to find and resolve cybersecurity vulnerabilities in simulated environments. Top teams from the preliminary online rounds earn an all-expenses-paid trip to Baltimore, Md., for the live National Finals Competition, where students compete for national recognition and scholarships. The CyberPatriot field is divided into three divisions – the Open Division for public, private, and home school teams, the All Service Division for JROTC, Civil Air Patrol, and Naval Sea Cadet Corps teams, and the Middle School Division. In all, 4,404 teams registered to compete in CyberPatriot IX. Top teams in the Open and All Service Divisions’ Platinum Tier and the top three Middle School Division teams nationally will advance to the CyberPatriot IX National Finals Competition to be held on 3-5 April, 2017.